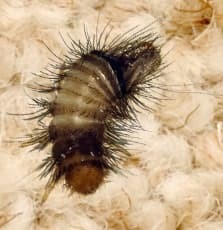 Australia is home to a wide variety of grubs and insects with the carpet beetle being one of them. This native beetle can be found throughout Australia in forests, gardens, woodland, and urban areas where it feeds on pollens. The larvae of this beetle are easily recognised for their brown fluffy bodies and bands of stripes. The grubs live for around 9 months feeding on animal proteins found in animal skins, hair, feathers, and other dried animal products. Unfortunately the tastes of the larvae also extend to the wool found in carpets and rugs, and they’ll munch happily away on it, causing permanent damage to the carpet. Synthetic carpet is not affected by carpet beetles. Although the beetles live outside, they will come indoors to lay their eggs on your fine looking wool carpet, at any time of the year, and on the whole they prefer the edges of the room and the dark, damp areas beneath furniture. Carpet beetle grubs are more active when the climate is warm, damp, and dark, and are fairly prevalent in Queensland. Because of the trouble that these grubs cause to wool carpets, those manufactured by Australian companies use wool yarn which has been treated with pyrethrum and bifenthrin, chemicals which are resistant to insect attack. It is however completely safe for humans. This can only deter the beetles from attacking your carpet and will not kill them, since due to chemical overuse, the beetles have immunity to such chemicals. So how can you prevent your wool carpet from beetle attack? It’s important to keep your wool carpet clean and vacuum it regularly. Pay particular attention to the edges of the carpet and move your furniture so you can run the vacuum beneath it. Carpet beetles like to live in birds nests so be sure to remove any that may be around your property and do not bring them indoors. Keep your fly screens closed so that the beetles can’t fly indoors. Check any flowers being brought inside for beetles. You can also spray a domestic residual insecticide under furniture, at doorways, and around the edges of floors every year. Carpet Cleaning Kings can assist with any type of insect infestation so give us a call for a free quote. We also have wide experience of cleaning wool carpets and rugs, so if yours haven’t been professionally cleaned for a while, we can help. What Exactly Is Hot Water Extraction Anyhow?